In the wake of the largest security breach in U.S. military history, the mainstream media have struggled to report all the facts about Bradley Manning, the Iraq war soldier in the middle of the Wikileaks scandal. In an effort to pursue political correctness over truthful journalism, ABC, CBS and NBC ignored uncomfortable facts about Manning's sexual orientation and history of "emotional fragility," choosing instead to describe him as an "outcast who tried desperately to fit in." CBS is worst offender, highlighting Manning's "supporters": 29 Manning stories, and zero homosexual mentions, but at least one story about Manning's "advocates" in Berkely, Cal. Bradley Manning is the prime suspect in the largest security breach in U.S. history. 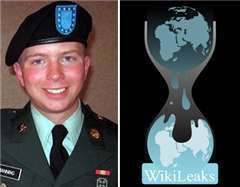 The 22-year-old soldier accused of illegally sharing thousands of sensitive war-time documents to Wikileaks. Wikileaks is a website for exposing government misconduct through (sometimes) classified material. The full extent of Manning's potentially treasonous actions is yet unknown, but could reportedly put thousands of troops in jeopardy and endangered Iraqis who cooperated with the United States. U.S. military officials have "reason to believe that the information could cause injury to the United States." Despite reports from The New York Times, personal Facebook wall posts and warnings from family and friends about Manning's "disrupted childhood" and problems with authority, a year's worth of network coverage painted Manning has taken its cue from the left, to whom Manning is a heroic whistle-blower who "feared for the future of his country and he felt desperate to correct our course," as one Barton Kunstler wrote in the Huffington Post. June 2011 marks the one year anniversary of Bradley Manning's arrest in connection to the Wikileaks scandal and his "supporters" in the U.K. commemorated him. According to The Western Telegraph, a British newspaper, Julian Assange (Wikileaks publisher), Daniel Ellsberg (1971 Pentagon Papers whistleblower) and Christina McKenna (arrested protestor and Manning supporter) were among the "internationally known advocates [that] held a teleconference to discuss his case." A year has passed since Manning's arrest, but a year's worth of Manning coverage exposes the networks' desperate attempts to ignore evidence and sympathize with a man charged with "aiding the enemy." CBS was the worst offender, offering the most stories about Manning (29) and completely disregarding the known fact that Bradley Manning is gay. ABC ran 14 stories between May 1, 2010, and May 1, 2011, about Manning, and every single story skipped what some consider a key fact in the case: that Manning is a homosexual. NBC was the only network to mention Manning's sexual orientation, but only in three out of 28 stories (10.7 percent). But more comprehensive journalism regarding Manning appeared in at least ten U.S. and international newspapers in the same time period, May 1, 2010, through May 1, 2011, including that he is gay, a somewhat uncomfortable fact for the media. When the facts are reported by other reputable sources like The New York Times and The Guardian, the networks had no excuse to exclude it. Reports that Manning is gay surfaced as early as August 2010, as noted by The New York Times. Ginger Thompson wrote of Manning on Aug 9, 2010, "He spent part of his childhood with his father in the arid plains of central Oklahoma, where classmates made fun of him for being a geek. He spent another part with his mother in a small, remote corner of southwest Wales, where classmates made fun of him for being gay. Then he joined the Army, where, friends said, his social life was defined by the need to conceal his sexuality under 'don't ask, don't tell' and he wasted brainpower fetching coffee for officers." November 2010, was just the beginning of Manning reports. On December 1, 2010, the New York Post covered Manning's telling Facebook account posts, writing, "It reports that in May, serving at a base near Baghdad, he changed his status to 'Bradley Manning is now left with the sinking feeling that he doesn't have anything left" … Five days later, Manning, openly gay and half-British, wrote that he was 'livid' after being 'lectured by ex-boyfriend'." On December 6, 2010, Jon Ungoed-Thomas writing for The Australian listed Manning as "gay" among a number of other facts. "After his parents separated, Manning moved as a young teenager with his Welsh mother, Susan, to Haverfordwest in Wales," Ungoed-Thomas wrote. "He moved back to the US after finishing school and told friends he was gay. He took a series of low-paid jobs before joining the army." Again in January, "The New York Times" didn't shy away from mentioning Manning's sexual orientation in a piece that highlighted Daniel Ellsberg, of the famous "Pentagon Papers" in 1971. Scott Shane wrote "[Ellsberg] denounces Private Manning's seven months in custody and media coverage that has emphasized the soldier's sexual orientation (he is gay) and personal troubles. Mr. Ellsberg, 79, calls him a courageous patriot." Across the pond, they noted manning's sexual orientation in a piece for The Guardian on March 16, 2011. David Leigh wrote, "The 22-year-old junior soldier had recently come out as gay, and had a disrupted childhood and a troubled relationship with his father…"
Even prominent gay publications were reporting Manning's sexual orientation as early as November 2010. Glenn Greenwald, an open homosexual and controversial columnist, made specific mention of Manning's sexual orientation when discussing the Wikileaks "hero" saying his homosexuality is a "huge advantage." Out magazine, a well-known gay publication, published a three-page profile on April 19, 2011, about Greenwald in which the author offered a few comments on the public perception of Bradley Manning. "Greenwald believes Manning might have been less likely to reveal government secrets if he were straight," wrote Out author Fred A. Bernstein. 'Gay people, because they're already 'outside the sphere of comfort,' have a 'huge advantage in being willing to challenge authority,' he says, speaking from experience." The Advocate, another popular homosexual magazine and website has featured articles about Manning's sexual orientation since November, 2010. "The U.S. Army analyst suspected to be the architect of the Wikileaks scandal that has rocked governments and their leaders around the world was reportedly a gay soldier who was unhappy with his job," wrote Advocate.com editors on November 30, 2010. There are 25 posts about Manning that have appeared on Advocate.com. According to his Facebook page, Manning was open about his sexuality. PBS recently discovered that Manning's Facebook wall posts indicated that he was socially connected to pro-gay causes and also very public about his negative feelings toward a former lover. PBS posted the annotated version of Manning's Facebook wall, leaving in telling posts like "Bradley Manning is beyond frustrated with people and society at large," and "Bradley Manning is livid: first lectured by ex-boyfriend despite months of relationship ambiguity; then personally attacked over 'ex-'boyfriend" (with scare quotes) and "lifestyle." In the few instances where the networks mentioned Manning's sexual orientation, it was used to help paint the alleged traitor as a victim. When "Today" anchor Meredith Vieira began a three minute segment to find out "just who is Army Private First Class Bradley Manning," on Nov 30, 2010, NBC Chief Pentagon correspondent Jim Miklaszewski was on hand to sympathize with Manning, asking, "But why would he possibly do it? Ginger Thompson of the New York Times profiled Manning and found that as a young man, he was an outcast who tried desperately to fit in." "As a young kid, he was teased all the time in elementary school for being a geek," Thompson told viewers, conjuring up images of a childhood victim. "When he was in high school, he got beat up often because kids figured out that he was gay." Miklaszewski continued the narrative stating, "Friends say Manning eventually joined the Army to impress his father. But once in the military, he quickly became a target." Thompson continued, this time making the U.S. Military out to be Manning's bully. "As a gay man in the military … he was outcast and he was, you know, teased and harassed." Ten days later, "Today's" Matt Lauer introduced a pitying segment in which reporter Mike Taibbi painted a picture suggesting Manning was a pathetic victim. "Bradley Manning was the undersized sax player in the band, the straight 'A' student with all the answers on the Quiz Bowl academic team and, says lifelong friend Jordan Davis, a kid who often got under his classmates' skin," Taibbi reported. After a brief statement by 'Wired' magazine's Editor Kevin Poulsen in which he claims Manning described himself as a 'hacktivist,' Taibbi continued to tow the line that Manning was a born rebel, as if his "hacktivist" ways were somehow equivalent to the more noble act civil disobedience. "But in Crescent, some remember that he sometimes refused to say the Pledge of Allegiance… They talk about his troubled home life and the impact of his parents' divorce, about a boy who later joined an army that would not allow him to serve openly as a gay man, a solider who disavowed his own roots. Of his tiny God-fearing hometown, Manning would later write, 'I was the only one in town who was nonreligious. I am Godless'." Over at ABC on the July 26, 2010 "World News with Diane Sawyer," reporter David Muir described Manning as a thoughtful dissenter. Muir described Manning as an "army intelligence analyst who over time it's believed became disillusioned with US foreign policy." He went on to say, "The soldier wrote of feeling socially isolated, in trouble with his supervisors, questioning the course of the war." Muir stated that Manning's father claimed he had never before been in trouble. "He said he had access to secret information when he was a vet, and never would have leaked information, saying his son was a good kid," Muir said. "In fact, Diane, he said he'd never before been in trouble before." Manning's father may have said that, but ABC failed to counter that statement with evidence that Manning was a troublemaker. Katie Couric briefly mentioned Bradley Manning's alleged crimes on the Dec 14, 2010, broadcast of "The CBS Evening News," choosing instead to emphasize a resolution proposed by Manning's supporters to declare him a "hero." "Meanwhile, U.S. Army Private Bradley Manning is suspected of providing Wikileaks with many of the secret documents and video it's posted,' Couric stated, downplaying the potentially damaging consequences of exposing top military documents. 'Some critics consider that treason, but tonight in Berkeley, California, the city council is expected to vote on a resolution declaring Manning a hero. Many of the leaked documents concern the war in Afghanistan." Far from being the hero held up by left-wingers like the Berkeley city council and Huffington Post's Kunstler, the evidence points to Manning as emotionally and perhaps mentally disturbed. His parents, military superiors, former employers and personal Facebook posts indicated that he suffered anger management issues and was unbalanced. "Manning's family say that the young soldier should never have been posted to Iraq, and was already showing signs of depression before being sent there," wrote David Leigh on March 16, 2011, in The Guardian (U.K.). "The 22-year-old junior soldier had recently come out as gay, and had a disrupted childhood and a troubled relationship with his father ... Manning was an unlikely soldier, who recounted that his custom dog tags gave his religion as 'humanist,' and had strong political opinions." On May 4, 2011, the Washington Post Lifestyle magazine published a telling, five-page profile of Manning, revealing he had a "history of emotional outbursts throughout his youth, and they continued during his Army service, culminating in a breakdown in Baghdad," wrote reporter Ellen Nakashima. "Moore, his former classmate, said that if someone crossed him, 'he'd pick up a book or notebook and slam it on his desk, or his face would turn bright red.'" Manning's missteps with former employers was noted by The New Zealand Herald as early as July 7, 2010. "After Manning graduated from high school and returned to Oklahoma, he quit or lost jobs in food service and retail in Tulsa, Davis said," the Herald wrote, gathering information from Manning's friend Jordan Davis. "Manning said he was pending discharge for an 'adjustment disorder,' …"
His military leaders noticed 'odd' behavior. Terry Moran, reporting for ABC's Nightline, on November 29, 2010 noted that Manning had had trouble in the Army before the Wikileaks scandal, reporting that Manning had been "demoted from specialist after being charged with assault," Moran said. "Sent to a chaplain when superiors noted odd behaviors. Then, last spring, he reached out online." The same Washington Post Lifestyle Magazine piece included a quote from Joel F. Brenner, a former national counterintelligence executive commenting about Manning's warning signs. 'Manning, with a history of emotional fragility, should at a minimum, have had his clearance reviewed," Brenner said. "His outbursts and emotional issues 'should have been the big trigger,'" the piece continued. So maybe in this sense was Bradley Manning a victim: Superiors aware of his emotional problems should never have put him in a situation where he was able to betray his country. As for the networks: if they feel compelled to ask "why would he possibly do it?" they are obligated to report all of what they find out, even if it upsets their liberal sensibilities.